From the creators of the Caldecott Honor-winning John Henry comes a reimagining of Helen Bannerman’s Little Black Sambo. 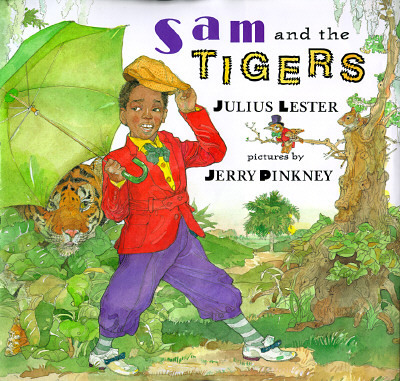 Julius Lester uses his inimitable black southern storytelling voice to bring new life and laughter to Sam, a little boy with bright new clothes who encounters a group of tigers on his way to school. Like his breathtaking animal illustrations in The Lion and the Mouse and The Talking Eggs, Jerry Pinkney’s tigers prowl off the page and leap into the imagination. All of the Lester and Pinkney trademarks are present: wit, humor, and the perfect marriage of words and images, making this classic folktale accessible to new generations.